Final Equipment List | Mike Evans. I got a chance to read a number of gear lists before I took my trip and I found them incredibly helpful. I’ve put my own spin on the traditional list by reporting what I had at the end of the trip rather than the beginning. 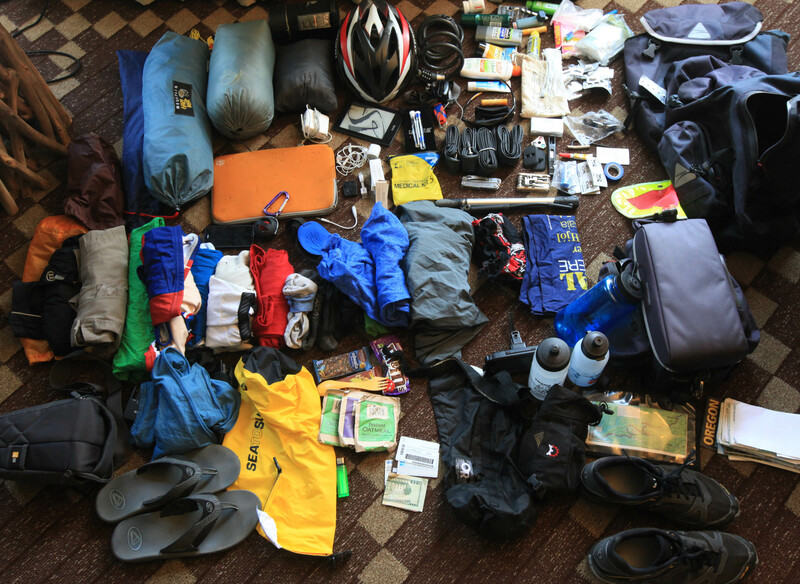 So here’s the final tally of stuff that made it through 75 days on the trail. One of the most common questions on the trip was, “How much did this cost you?” Paul was fond of answering that the biggest cost was in the lost time getting a paycheck. The amount of opportunity to earn far outweighs the cost of gear. The obvious implication of that fact is go ahead and spend the money on an item if it is going to make your trip better, because you probably won’t get to do it again. This really only played out in terms of the bike, 11″ Macbook air, and the flash new camera lens that I got for the trip. I further justified that decision by the fact that the big ticket items are still very valuable to me after the trip is done. By far the most expensive aspect of the trip. I’m riding across the country, and I want to SEE it. I don’t want to be staring at the shoulder of the road for three months. So, I want a recumbent. The final choice was the Easyracer Gold Rush. I opted for the titanium version as I’ve always preferred titanium to steel, aluminum, or carbon on racing bikes. It has a “softer” feel, and is extremely lightweight. Here’s the link. I justify the cost because it replaces a car for me, and I plan on using it for touring and commuting for the next decade. I picked the Axiom Randonneur line because they are waterproof, so no additional cover bag when it starts raining. They are superior to the Ortlieb rollers in that they are easier to access. The clips are a lot less time consuming than rolling. It doesn’t sound like a big deal, but getting into those bags dozens of times a day it adds up. I also like that the 60L bags have a rear external waterproof pouch. These are good spots for emergency tools, first aid kit, and toiletries. Quilt bags have no back and no hood. Mine is the Katabatic Chisos. Using a couple of short cords across the open back, this slips over the sleeping mattress to create a single unit. Combined with a packable down jacket this bag kept me warm even on nights when the temp was in the 20s. A tent needs to provide 2 things at a minimum: protection from bugs and protection from rain. In addition to keeping the rain out, a double walled structure is key for keeping condensation off me as I slept. This tent is the lightest one that can also stand up to moderate wind & light snow. I’ve spent about 150 nights in this tent, which is probably about 15 short of its total lifetime. When I get a new tent, it is going to be this one again. A sleeping pad provides more warmth and comfort than the sleeping bag. These Big Agnes pads have solid consturction and internal insulation fill to provide more warmth. Insulated pads still work well on warm nights… just toss off the sleeping bag. With an AT&T tethering plan and a high res camera I used about 45 GB. The only place I had a hard time connecting was Wyoming and a little bit of Idaho. I saved about 45 minutes per night vs the other folks blogging on iPads by having an actual keyboard, more powerful wifi antenna (crucial in rundown motels for stealing the WiFi of the businesses next door!). The Air also doubled as my emergency battery for my iPhone while out on the road. My camera was my big luxury item. 6 lbs of my total 79 were this gear right here. Anything more complicated than boiling water is too complicated. Over 80% of meals were in restaurants, so this was just for those times when Ramen, couscous, or mac & cheese was for dinner. Pearl iZUMi Men’s X ALP Seek V Cycling Shoe with recessed SPD cleats. Shoes add a ton of weight and bulk, so bringing an extra pair wasn’t an option. These shoes were ideal for walking, running, and cycling. The recessed cleat made them appropriate for using in towns and restaurants without breaking an ankle. The running setup made them dry out very fast. Power generation, including a solar panel and a hub dynamo. The other long sleeve shirt is just perfect for morning rides. Two long sleeve shirts are excessive, because if it is cold enough to need them, then I wasn’t sweating. Therefore, I didn’t need to wash this as often. I used my camping headlamp as necessary. Three sets shirts, socks, underwear gives me three days between laundry. Which is enough. Charging a USB light is much more convenient than buying new batteries.